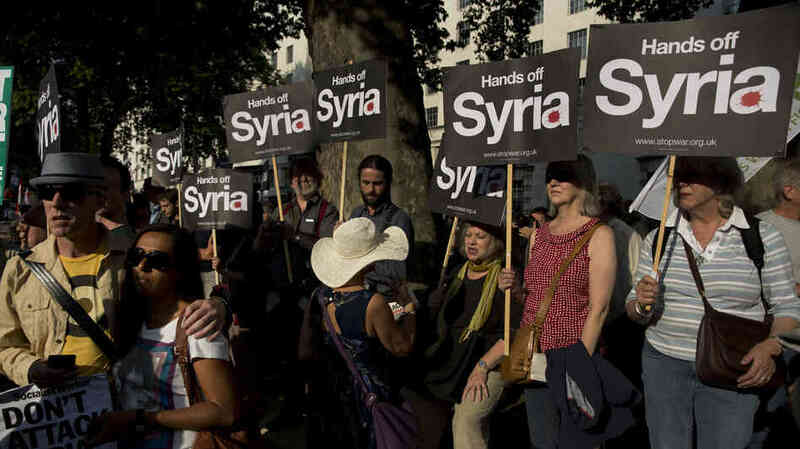 The British parliament’s rejection of military action in Syria this week may be just enough to halt the manic march to all-out war – a war that many fear would not only engulf the Middle East region, but could lead to a global conflagration. The manic march is under the orders of the imperial rulers in Washington, London and Paris – in apparent defiance of a global consensus that is sick of endless, illegal, bankrupting wars conducted by these unaccountable rogue Western regimes. But could we have reached a positive turning point? Could Syria represent a Damascene moment of revelation? This would not be due to any benign awakening among the Western political class, but rather out of a sense that the vast majority of ordinary people are acutely aware and implacably against any further war-making propaganda stunts. The British parliamentary vote against military action in Syria is reflective of the public anger and indignation against unaccountable rulers constantly banging the drums of war. Polls show that the majority of ordinary citizens in the US, Britain and France in particular are firmly opposed to any military intervention in Syria, yet their rulers insist that they have the «moral authority» to fire cruise missiles and launch air strikes on the strife-torn Arab country – a strife that has been covertly fomented and exacerbated by the these same Western powers, resulting in more than 100,000 deaths over the past 30 months. The policy of these Western states towards Syria exhibits the wider problem of dysfunctional democracies under a bankrupt capitalist system. The Western public does not want war; they want jobs, social welfare and public services. Nevertheless, the citizens are instead told that there is no money for such public goods, however there are somehow funds to mount yet another foreign war – all on the back of yet more dubious claims that have likewise underpinned previous wars over the last 10 years. This tendency of unilateral, unaccountable warmongering just received a welcome blow. On Thursday, the gung-ho British Prime Minister, David Cameron, suffered a stunning defeat when members of his governing Conservative party joined with opposition Labor parliamentarians to vote against military strikes on Syria. Days before that, Cameron had imperiously given a commitment to US President Barack Obama that British forces would augment American military attacks on Syria following hoary accusations from Washington, London and Paris that the Syrian government had used chemical weapons on its own people last week. However, Britain will not now be part of any US-led «coalition of the willing» to attack Syria. 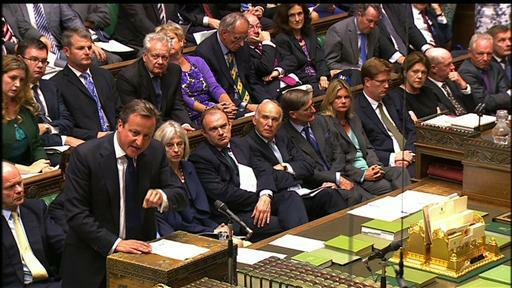 Cameron showed surprising modesty when he said after the parliamentary setback that he would obey the will of the people and desist from military action in Syria. Not that Cameron has undergone an ethical conversion. He simply has enough savvy to know that his government will be torn to shreds by an outraged public if he dares engage in unilateral militarism at a time when austerity and poverty are crushing millions of Britons. This absence of America’s «special partner» in imperialist adventurism, adds to Washington’s increasing problems of launching a war on Syria. Officially, the White House is still proceeding with plans for military intervention, despite the British parliamentary No vote. Some commentators speculate that the US may gave the orders on Sunday for cruise missile strikes from its five warships currently off the coast of Syria. One factor is that Washington is possibly waiting for the UN chemical weapons inspection team to leave Syria this weekend. The team, led by Ake Sellstrom, is due to depart on Saturday and immediately report its findings to the UN General Secretary, Ban Ki-Moon. It is significant, too, that the other member of the Western triumvirate, France, has also toned down its initial bellicose rhetoric. At the start of the week, French President Francois Hollande was warning that his country was «ready to punish the Syrian regime» over the alleged chemical weapons attack. But on the same day that the British MPs voted against military intervention, the French leader had decidedly calmed down and was urging «a peaceful, political solution» to the Syrian crisis. That leaves Washington isolated on the United Nations Security Council, with Russia and China both having made clear their categorical opposition to any military strikes against their ally, Syria. Furthermore, within the US itself, the Obama administration is facing stiffening resistance to its threats of another war in the Middle East. US officials may claim that their military is preparing to use «limited surgical strikes» aimed at cautioning the Assad government over its alleged use of chemical weapons. But no one is buying that. Military strikes of any kind are the beginning of a slippery slope into uncontrollable all-out war. A letter signed by 140 American lawmakers warned the president that any move to use military strikes against Syria would violate the US Constitution without first obtaining authorization from Congress on such a deployment. As in Britain, American lawmakers seem to be heeding the public’s contempt for intelligence conclusions that are cloaked with «classified secrecy». This no doubt reflects increasing public repudiation of threadbare official lies and spurious pretexts to justify relentless overseas’ wars: fighting terrorism, weapons of mass destruction, responsibility to protect civilians. Adding fuel to the public ire are the recent revelations about massive illegal US (and British) government spying on citizens, which is compounding an already seething distrust towards these authorities and their unaccountable agencies. Again, Syria is a crystallizing point for many issues: illegal wars, a failing bankrupt economic system, and official lies about everything from unemployment statistics to chemical weapons. Not only is the increasing evidence of Western collusion with terrorism in Syria morally repugnant, it also drives home to the Western public the propaganda charade of the entire «war on terror». The latest claims by Western governments over the alleged chemical weapons attack as a pretext for military intervention smacks of yet more self-serving lies told by an incorrigible anti-democratic elite who profit from war, death and destruction. The alleged chemical weapons incident in three suburbs of the Syrian capital, Damascus, is still under investigation by a team of United Nations technical experts. Tellingly, the UN inspectors are being facilitated by the government in Damascus; they were shot at earlier this week by unknown snipers while driving with Syrian security personnel on the way to collect incriminating field data; and the UN team is finishing off its investigation by carrying out tests on Syrian soldiers injured in the alleged gas attack apparently with the deadly nerve agent Sarin. But the American, British and French governments had embarked on a bombastic media campaign making strident assertions immediately following the incident on 21 August – in which hundreds were killed – that it had been perpetrated by Syrian forces loyal to President Bashar al Assad. Washington, London and Paris typically did not provide any verifiable evidence to support their assertions – just as they did not provide evidence to back up similar earlier claims over the poison gas attack in Khan al-Assal in March. An official Russian study into the Khan al-Assal incident – whose results were independently verifiable – found that the perpetrators were the Western-backed mercenaries trying to topple the Assad government. US officials are now claiming that they have based part of their conclusions over the latest chemical weapons incident near Damascus on intercepted phone conversations between «senior regime figures». But this purported US intelligence is not presented. Likewise, the British and French governments balk at disclosing the «evidence» they claim to have that makes them so apparently certain in their accusations against Assad. The rush to escalate war in Syria by this cabal of three powers who don the mantle of the «international community» has mobilized widespread alarm and resentment among the actual international community of preponderant governments and citizens. The credibility of the US and Britain in particular following their genocidal wars in Afghanistan and Iraq, which were subsequently shown to be based on entirely false claims, is at an all-time low in the eyes of the world. The French have tarnished any moral authority they may have had with participation in the neocolonial NATO blitz on Libya in 2011, and then its unilateral intervention in Mali earlier this year. The latter operation was allegedly conducted to prevent radical Islamists toppling the Francophile regime, yet the France along with the US, Britain and others are supporting similar extremists trying to overthrow the sovereign government in Syria. Syria is still very much in danger of being attacked by the US military in the coming days. The crisis-ridden capitalist system that the US presides over is wired for war and perhaps the warmongering American elite may be immutable in the face of widespread political opposition, both within the US and around the world. But, having said that, one glimmer of hope is that Syria perhaps represents a point in history where Western rogue rulers and their rotten capitalist system are no longer able to launder their lies for war. The world’s public can finally see the filth and who is causing it.